Located in the Rio Grande Valley of southern New Mexico, this 3500-square- foot adobe house straddles two landscapes. One is the desert: a realm of mesquite, saltbush, creosote, and jackrabbits. The other is the river valley: a realm of cottonwoods, tamarisk, alfalfa and geese. One landscape is relatively uninhabited by man; the other has been influenced by over 400 hundred years of irrigation and agriculture. The house consists of two wings of rooms arranged around a courtyard. 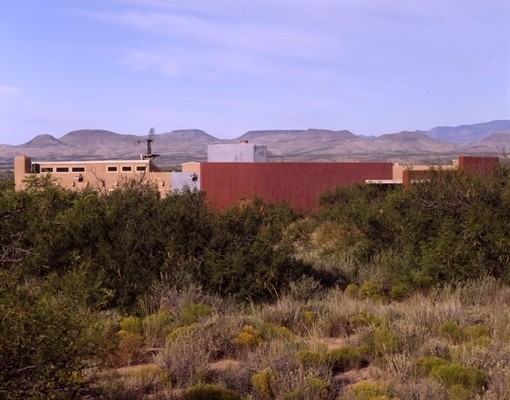 The east wing is nestled among the mesquite and saltbush and is more sculptural in its response to the landscape. This is the more private wing and consists of the living room, master bedroom, and master bath. The west wing rests on land that had been previously graded for agriculture. Its response to the landscape is based on the local vernacular tradition. This is the more public wing and consists of the kitchen, dining room, two guest rooms, and two studies. Access to these rooms is along an eight-foot-wide portal which wraps the east side of this wing, letting in the morning sun while providing shade in the afternoon.